A small public-opinion poll showed that only very few humans know about the lights, which light up there home or workplace. For those who do not have the time to read all our “LED function” sides, we concentrate the 3 most important criteria, which one should consider with the purchase of an LED. Lumen is the indication of the entire light achievement of a shining object, independently of its shining direction. One can figure lumen, like an intransparent purchase bag. I stand infront of the fruit section with an enormous shelf of apples. There are green, yellow, red, small and large apples. The price tag indicates: All apples cost the same. You mixes some sorts, the shop assistant packs it into the bag and you pay at the cashier by weight. That means, only the weight is important to the cashier but not whether your apples are green or large. With lumen it behaves so similarly. Lumen indicates the entire light achievement (weight). It never mind if the LED has a beam angle, where the entire light is concentrated or you bought a 360° LED. Only the entire light achievement counts! Untder Watt (W) one can figure as his personal WORK. The more highly the number of Watts, the more one must work, to pay its electricity bill. High number of Watts - high electricity bill and environmental impact. Small number of Watts - the environment and your wallet will thank it you. If the valuelm/W is smaller than 20, one should leave the fingers of it. To consider would be here still the life span. It is clearly obvious that, if one must change every 6 months its lamp, it is not realy cheap. LEDs shine up to 50,000 hr. I.e. at 5 hr. on the day, 330 times in the year, that would be 30 years!!! One lux corresponds to the luminous intensity, which a candle produces at a distance of one meter. In our synoptical table the Lux values would be the cd number for a distance of 1m. If LED manufacturer only indicate the lux, it is a little more difficult the conversion in lumen, because mostly only the reflected beam angle is indicated however not the Sterad (sr). The sr is the solid angle, which is necessary for the computation. Therefore we arranged the lower SR table. Now one must multiply only A by the lux to receive the lumens. If LED manufacturer only indicate Candela (cd) you have to multiply thecd with thesr. Which mood would I like to produce? WHITE IS NOT EQUAL TO WHITE! WHITE IS NOT EQUAL TO WHITE! Therefore the color temperature in Kelvin (K) is indicated. Who does not pay attention to the color temperature, can be heavily disappointed with the developed “lighting tendency”. 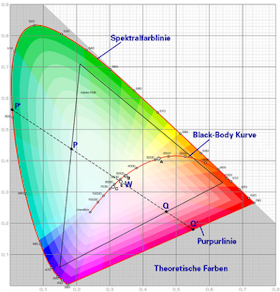 If the individual LEDs are differently dimed or switched off, then nearly all colors could be created. Which reflected beam angle do I need? The reflected beam angle, belongs to one of the most important criteria, which one should consider with the purchase of an LED. Here it can come easily to errors. The first question which I must ask is: Which surface I would like to illuminate? Spots, as e.g. in the video, targeted on a ceiling or a white wall can produce the same as a 360°. LED own itself therefore outstanding for indirect lighting! In the comparative table at beginning of the side a Halogenspot is indicated with 50W and 3,500 CD. WOW! 3.500cd some will think! But during the more exact reading also a reflected beam angle is indicated by 24°. 24° possess a solid angle (SR) of 0,137. Candle (cd) times SR = lumen (lu), thus 3,500 x 0.137 = 480 lu. That is a price performance ratio of 9,6 Lummen/W (choke) with a price of 6,59 €. Taht means you bought a favorable heating with a high electricity bill! But also some LEDs are "energy eater". The Power LED Spot 6W E14 warmweiß e.g. promises 3,100 lux with 6W. And again some will think in such a way, does not sound so bad at all! But with the calculation it looked then unfortunately completely differently! 15° are 0.0538 SR. With a distance from 50cm, the lit surface amounts to 0,013m ². Lux x A = 40,3lm!!! That would be 6,7lm/W (choke ³)!!! thus a much bad value as a bulb!!! and this at a price of 44,99 €!!!. Apology: We got an answer from the producer: Aussagen über den Lichtstrom bei Reflektorlampen auf Basis der Beleuchtungsstärke können ohne eine räumlich integrierende Messung nicht so ohne Weiteres getroffen werden. The LED Spot has 125 lm and use only 6W. Hmm... that means 20,8 lm/W. Thus who loves the environment, please always compute the Lummen/Watt value!!! Example for the elucidation: We mental take e.g. the LED Spot 38° 3,5W (see table, click the product for more information), and break the bulb socket “in mind” away and replace them now with a reflected version those a reflected beam angle of 24°, like the halogens spots. I.e. we bundle now the entire light of 38° on 24°. It is clear that on 24° the lit surface illuminates becomes more strongly than before. CD = lm: SR. Thus 342: 0,137 = approx. 2500cd (24°=0,137sr) we made from 1000cd…. 2500cd. Thus straight once 1000cd less than the 50W halogen spots, but with only 3,5W! Here we see that the reflected beam angle plays a very important role! At present there are no 360° LEDs available. Therefore one combine several LEDs together to produce a larger reflected beam angle. Spots, targeted on a ceiling or a white wall can produce also a 360° light. How to make your own 360° LED lamp. A lampshade (white), with 3 pic., e.g. LED 160° 3W in the correct angle equipped and one would have an economical 360° alternative with 9W, with 66,67 lm/W, which could replace a 50W bulb. Or 3 x LED 270° 4W, could replace a 50W bulb with only 12W. For a 360° lighting also the special refuse-requiring energy-savings lamp are a "good" change over solution. Please read here our energy saving site.The OSRAM energy-savings lamp 8W captivates here with 50lm/W and e.g. replaces a 40W bulb. Ore 3 LED 160° 5W und we get a 15W Lamp which can replace a 100W bulb and this with 70lm/W!!! But also LED "fluorescent tubes" are getting more and more populary. Who still would like to make here some experiments some further example: For 360° lighting with LEDs it is important to know the "portion" of the sphere in which an individual LED radiates. Therefore we arranged the lower table. the correct lighting or lighting mood contributes very much to our well-being. Therefore we do not understand why some supplier do not indicateon the packing or in the description, the most important data, i.e. 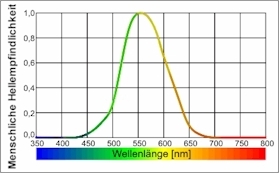 : Color temperature conceal (°K), light-current (lumen, lm), reflected beam angle (°), luminous intensity (Candel, CD) and the density of light (lux). If you are interested in an LED and these data are missing, please absolutely contact the manufacturer. LEDs hold for a very, very long time and it would be unfortunate if one then would be not content with its LED lighting.